1 The first sailor was perhaps someone who grabbed onto a fallen tree floating down a river. When man saw that trees could float, he used that information to provide himself a new form of transportation. Early man was surrounded by water in the form of lakes, rivers, and oceans. He was able to get from one place to another using his feet. Being able to get across bodies of water was not so easy. When man learned to use wood in order to cross these bodies of water, a great problem was solved. 2 Archaeologists have found the remains of what may be the world's oldest boat that date to about 10,000 years ago. It is known as the Pesse canoe. Man might have made some kind of sailing vessel even earlier than that. The earliest boats to sail across the oceans may have existed more than 40,000 years ago. That might explain how people came to the continent of Australia. As soon as man had created tools that could be used for shaping wood, it was time to put water to a new use. Humans drank water, fished in the water, and now it was time to use the water to take them to new places. It was time to explore. 3 The early Egyptians may have been the first to build large ships. 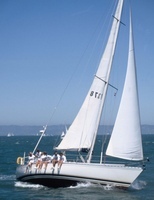 Early sailors learned that even a single sail on their ship could catch the wind and move the ship through the water. Unfortunately, the wind did not always blow at the right strength or in the right direction to get them where they wanted to go. To make sure the ship would always get from one place to another, early ship builders also provided room for oars. The oarsmen could use these oars when the wind was not blowing. Some early Egyptian ships were rigged for forty oars.